Swedish researchers might be able to use science to access a great deal of information from someone’s eyes, but the rest of us can use observation and a little intuition to obtain information as well. We can assess mood, age, sleep, disease, interest and even fondness for particular substances. The eyes are often the first thing that people notice about an individual, and unfortunately, they are often taken for granted. I didn’t realize how important my eyes were to my character and personality until I was hit in the face with a line drive during softball warm-ups two weeks before my high school graduation. With two black-and-blue shiners, I had a difficult time communicating my mood and spirit to people. When they healed, you can bet I pampered them with the prettiest eye makeup I could find. I valued my eyes. When I became a mom, I again started to undervalue my eyes. (Let’s face it, though, a lot of features were suffering at that point.) I’d put on eye cream when I could, but I wasn’t caring for them and enhancing them like I should have been. 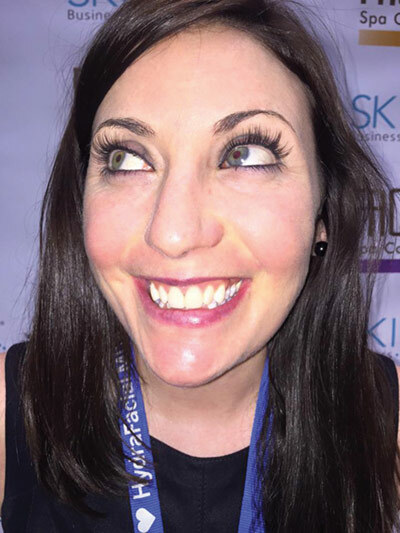 A few weeks ago at Face & Body Midwest, the amazing team at Borboleta gifted me a beautiful, long set of lashes (see picture above). After my lash artist Sam was done applying my lashes, I batted my lashes like never before and gained a new lease on my eyes. I have been properly caring for them since. I’d venture a guess that you probably have a host of clients (and maybe even yourself) who are not caring for their “soul windows” like they should, be it with the right skin care or the right cosmetics. Recognizing and answering this need can not only help you earn their trust as a regular client, but also can bring more money into your spa business. This issue of Skin Inc. is all about eyes, with articles on combatting tired eyes, lifting eyes without surgery, addressing eye lesions and selecting personalized eye makeup based on eye, skin and hair color. We’ve given you the tools to ensure that your clients care for their eyes properly. Let’s value them and never again take them for granted.